Stand Up Against Bullying - Wear Pink! Today was International Stand Up Against Bullying Day, and ISTP students, faculty, and staff celebrated by joining in and wearing pink. This was our third year joining in the movement, and I was very impressed with the support from members of our community. 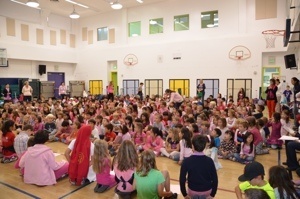 Some classes even had 100% participation by students wearing pink. Student Council decided to sell pink wristbands that say "ISTP: No Bullying Zone!" in order to raise awareness and reimburse purchase costs. Stand Up Against Bullying Day (Wear Pink) started in Canada when a 9th grade boy was bullied for wearing a pink shirt on his first day of school. Some older boys heard about it and decided to take silent action. That afternoon, they went to a store and bought all of the inexpensive pink shirts that they could find. They emailed their friends to tell them to wear pink the following day. The next day they passed out the shirts they had purchased. The school was literally a "sea of pink". The bullied student went from being miserable to having a huge weight lifted off his shoulders. The other students had taken silent action against the bullies, and boy did those bullies feel silly! They definitely thought twice before bullying again. ISTP's mission is very much about the inclusion of all different people from "many cultures" into "one world". 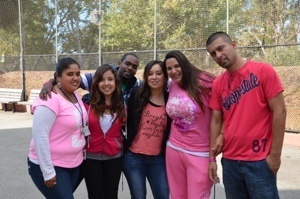 Pink Day allows our community to unite as one and show that we will not accept bullying, either physical or verbal. It opens up the lines of communication in class, on the playground, and amongst different parts of the communities in order to educate everyone on the damage that bullying can do. As one 5th grade student said, "Wearing pink shows that people should not be bullied for what they wear. It shows unity at ISTP." Thank you students, faculty, staff, and parents for your support in Standing Up Against Bullying!